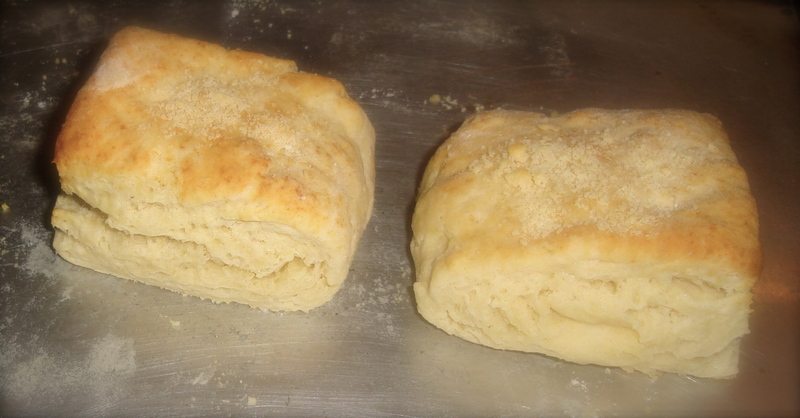 To my way of thinking there’s not much that compares to the smell and taste of homemade biscuits hot from the oven. A simpler bread there never was, nor a more adaptable one. 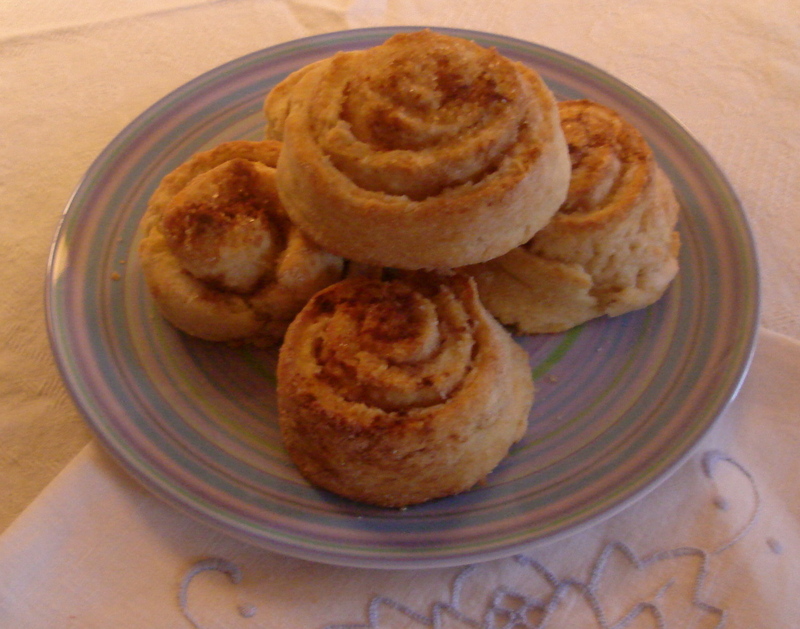 You can fill them or roll them up with sugar and cinnamon. You can serve them at any meal of the day, accompanied by butter, jam, honey or just bear naked; they never fail to please. If you’ve got a big Kitchen Aid mixer or the like, it does the work for you, and if you’ve followed my advice and bought yourself a pastry mat, clean up is a breeze. So this is why it surprises me that those nasty baking mixes continue to line the supermarket shelves and can readily be found in homes across America. No one would make ’em if they didn’t sell. And don’t even get me started on this abomination. He has creeped me out ever since I learned to spin the dial on the big Motorola floor model in Grammie Sue’s living room. That giggle, the fetal dough face, the neck scarf with no pants. Gives me a shudder just thinking about it. Always has. And if you’ve never taken a squint at the nutritional content (and I’m slinging the term nutritional around here with what can only be called reckless abandon) of Bisquick or the dough boy’s demon offspring, you really should. Nasty fats and sodium levels at least double what you find in scratch made biscuits. So let’s do this thing. Welcome to Biscuit 101. I’ll be gentle. 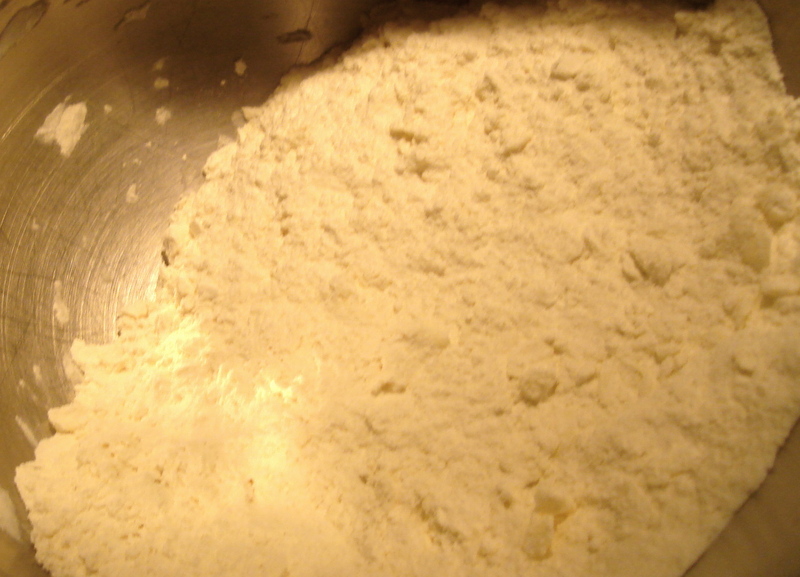 Once you’ve turned the dough out onto a floured pastry mat (or your counter as the case may be), turn it over to coat it with flour and knead it a few times until it becomes smooth and elastic. 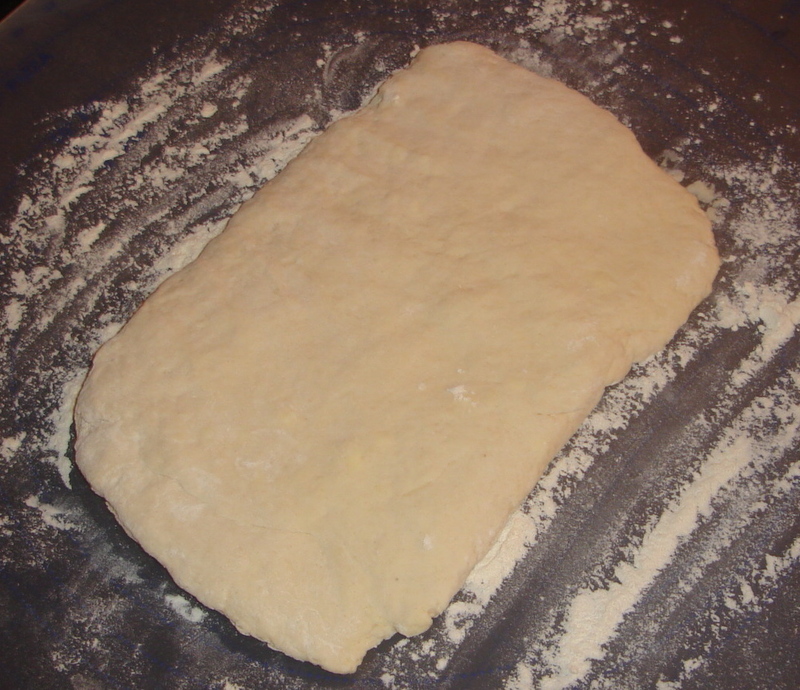 Roll it out or just press it flat with your hands until the dough is about 1/2 inch thick. Now, I never bother with a round biscuit cutter because I don’t want to deal with the scraps. Instead I just cut the dough into roughly equal squares and bung ’em onto an un-greased cookie sheet and into the oven. Traditionally biscuits are round, but really who cares? Bake for about 12 minutes, until golden brown. And that’s all there is to it. Whatsamatta you never saw square biscuits before? Drop biscuits. But only if you must. Courtesy allrecipes.com. Once you’ve mastered the basic recipe, feel free to improvise and experiment. Cheese biscuits: Add 1/2 C grated sharp cheddar or 1/4 C parmesan cheese with the buttermilk. Omit the sugar. 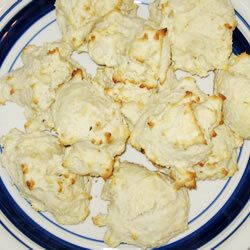 Drop biscuits: Increase buttermilk to 1 cup, skip the kneading and make drop biscuits instead. No kneading or rolling. I don’t do this because I find them unsightly, but who’s to say I never would in a pinch? Cocktail snacks: Wrap the dough (plain or cheesy) around little cocktail franks for pigs in blankets. Don’t pretend you don’t love them. Leftovers: Slice a biscuit in half and grill it in a buttered skillet until brown and crunchy on the cut side. Add a dollop of jam, or top with a poached egg. Cinnamon rolls: Roll out the dough to 1/4 inch thick, spread with softened butter and sprinkle liberally with cinnamon and sugar. You can also add chopped nuts or dried fruits. I did this with half of my biscuit dough. Roll up and slice for cinnamon rolls. A glaze would not be amiss here either. 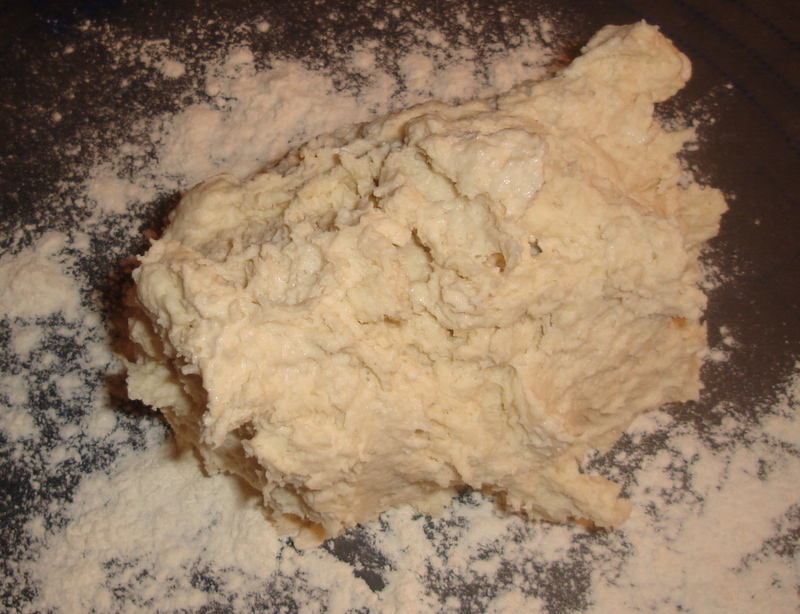 Posted on February 7, 2012, in Baking, Breakfast, Dessert, The easy way and tagged Betty Crocker, Biscuit, Bisquick, Breakfast, Classic Baking-Powder Biscuits, Cooking, Dough, Drink and Food, Entertainment, Flour, Humor/Commentary, Recipes, Sodium. Bookmark the permalink. 14 Comments. I made my first biscuit attempt this morning. It was, well, it was blog worthy…. My grandmother used to make us cinnamon rolls, and fresh apple pie with apples straight from the tree (and of course handmade pie crusts). This posts takes me down memory lane; Yum. Memory lane is a wonderful place to be. Thanks for coming by! You are most welcome. I wonder where the round requirement comes from anyway? An absolute waste of time; what’s more it yields no extra crunchy corners. Thanks for coming over! Lets see if I can duplicate. I am not a baker and tried doing cookies and they were a disaster. Will let you know when I make these. SO glad I found your blog…I enjoy it very much! So happy to have you! If I can do this, you absolutely can. Let me know how it goes. This looks easy enough, but I bet I’d find a way to screw it up. Nah. Just jump in. There’s enough biscuit race-memory floating around up there that you could probably do this without a recipe. Thanks for peeking in. Loved the spiced pitas!